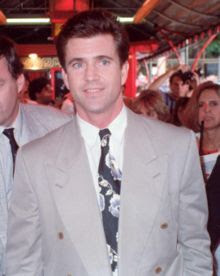 Mel Gibson is the son of Hutton Gibson and Anne Reilly Gibson, who was born in Columcille Parish, County Longford, Ireland. His paternal grandmother was the Australian opera singer, Eva Mylott. Mel was born in Peekskill, New York, the sixth of eleven children. One of Mel's younger brothers, Donal, is also an actor. Gibson's first name comes from a 5th century Irish saint, Mel, founder of the diocese of Ardagh containing most of his mother's native county, while his second name, Columcille is also linked to an Irish saint. Columcille is the name of the parish in County Longford where Anne Reilly was born and raised. Although Gibson is a native-born United States citizen, Hutton Gibson relocated his family to Sydney, Australia in 1968, after winning a work related injury lawsuit against New York Central. After a seven day trial on February 14, 1968, the jury awarded him $145,000. The family moved when Gibson was twelve. This move was in protest of the Vietnam War, for which Gibson's elder brothers risked being drafted. It is also because Gibson's father, a devout Traditionalist Catholic, believed that the changes to American society which took place during the 1960s were immoral.